Dhoni scored a match-winning fifty before getting out to Ben Stokes. MS Dhoni is one of the sharpest minds in cricket and is often termed as one of the best tactical captains the world of cricket has ever seen. The 37-year-old Jharkhand-born wicketkeeper-batsman has shown amazing game awareness and has predicted the bowlers’ intentions well before even the bowler knew what delivery he will bowl. Something similar was seen in the crunch situation of the match between Rajasthan Royals (RR) and Chennai Super Kings (CSK), as the CSK team needed 18 runs in the last over to be bowled by Ben Stokes. 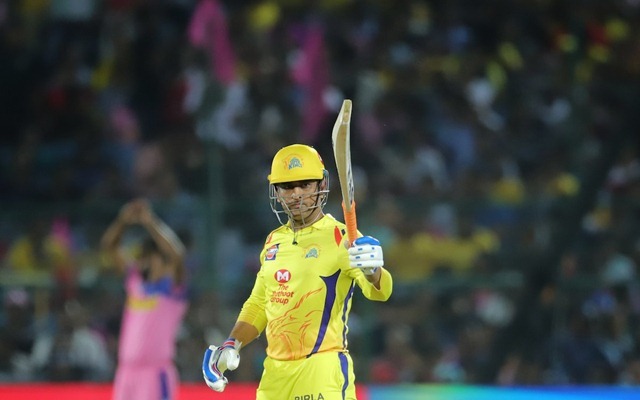 MS Dhoni had batted beautifully to bring the game to this juncture and Ravindra Jadeja had come out to join him at the fall of Kedar Jadhav’s wicket and the duo has rescued CSK from such occasions many times before. Dhoni who is known for street smart cricket predicted where Stokes will bowl to Jadeja and he passed the same to the left-hander and the rest is history. The all-rounder later revealed that it was MS Dhoni’s timely advice that helped him hit Stokes for that huge six. “Dhoni told me that Stokes will bowl outside the off-stump and full and I was standing on the off stump prepared for that. But he bowled it a little wide and I had to connect that shot because I had no other choice. But I was sure that the ball had hit the middle of the bat and luckily it worked out well,” Jadeja was quoted as saying by Times Now. CSK won the game after Mitchell Santner hit Stokes for a six off the last ball and Jadeja also celebrated as he completed 100 wickets in the T20 league. “It feels great to have taken 100 wickets in the T20 format, and I am very confident right now. I am enjoying both my bowling and batting, and I am able to contribute to my team,” Jadeja signed off.